Solar Panels are in general Silicon made Rectangular Shaped Glass Covered Products which Produce Electricity when exposed to the Sun.These Panels produce Direct Current (DC) Electricity which has to be converted by a Solar Inverter to Alternating Current (AC) Electricity to be used by Consumers .Note Solar Electricity can also be supplied to the Electricity Grid if allowed by your Utility.However in India,the industry is still immature and interconnections are not given to ordinary consumers in general.So you can use an Energy Storage Device to store Electricity.However Energy Storage Products like Chemical Batteries are quite expensive.Solar Panel produced Electricity usually costs between Rs 15-18 /KwH (much higher than the Rs 3-6/unit paid normally) which makes it uneconomical except in special cases like off grid applications.Replacing expensive Diesel powered Telecom Towers with Solar Panels is also an option.Sharply falling Solar Panel costs should make it competitive with your electricity in 2-3 years.In places like Italy,Solar Electricity is already competitive due to high prices of electricity. A Crystalline Silicon Solar Panel usually goes through 5 major steps before being produced.These 5 intermediary stages can all be done by the same company or different companies.First Polysilicon is cast into Ingots ,then Sliced into Wafers.These Very Thin Wafers are then Made into Solar Cells.These Solar Cells are Energy Units which actually convert Solar Energy into Electricity.Solar Cells are then Joined Together to Form a Solar Panel.The Panel is then put into a Frame and enclosed in Glass.Note there are different costs and processes associate with each step.The most technologically challenging step is the making of the cells.However equipment for making these intermediate products is widely and easily available. There are a number of Companies manufacturing Solar Panels in India and the domestic content requirements of JNNSM will give a further impetus to indigenous solar production in India.While upstream solar products like polysilicon and wafers are made outside of India,downstream solar products like cells and modules are made by some companies in India.Note most of the solar panels made in India is done through mainstream crystalline silicon manufacturing while a very small amount of production by Moser Baer is done through Thin Film amorphous Silicon (a-Si) Technology.The costs of the Indian manufacturers are higher than integrated Chinese companies like Trina Solar,LDK which make raw materials in-house.Due to low costs of transportation it might be cheaper for consumers to import solar panels from outside of India. 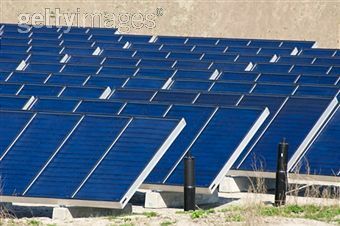 Solar Panels come in all sorts of sizes,colors and power.Solar Panels of 20-40 Watts are typically used for applications like a Solar Lamp,Lantern and products using small amounts of power.For Putting Solar Panels on the Roof for Generation of Electricity,sizes vary from 150 Watts to 300 Watts. 2) Moser Baer – is one of India’s leading technology companies, established in 1983. Moser Baer’s flagship company, Moser Baer India Limited (MBIL) is the world’s second largest manufacturer of optical storage media. Moser Baer Solar Limited is a subsidiary of MBIL. The Group’s photovoltaic manufacturing business was established between 2005 and 2007 with the primary objective of providing solar power as competitive & reliable source of energy. Its products include Multicrystalline cells & modules and Thin Film modules. This is primarily a Solar Panel Production Company which has recently made a big bet to get into the Power Production Space as well. Moser Baer Projects Private in which the Blackstone Group made a $300 million bet has plans of a 20:80 mix of Green and Dirty Power. 3) Solar Semiconductor – is an international organization that offers PV solutions, products and services to worldwide markets including the Americas, Europe, Asia and Africa. It manufactures its own PV modules and cells. Solar Semiconductor currently has a 195 MW manufacturing capacity and various Systems Integration projects around the world. It offers a comprehensive range of products including complete system kits and PV modules for grid connected as well off-grid applications. A Producer of Solar Power Modules and Cells, it renders services in Solar Installation as well. 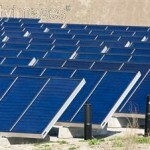 It also has a small capacity to produce silicon based solar cells or solar panels or both. 4) IndoSolar – is the leading Indian manufacturer of solar photovoltaic cells. Its manufacturing capacity is 360 MWp. The company has capacity to produce both multi and mono crystalline cells. 5) Topsun Solar – is one of the leading solar power solution manufacturers in India & International market. The company has vast experience in Renewable specific to SPV technology & solutions. The Company’s strongest areas are solar Telecom power system, KW to MW SPV Power Plant, Village electrification & Home lighting system. Its manufacturing unit is established with latest technology with their own R&D facilities for future development in solar solutions. 6) Titan Energy – is a major competitor in the distributed, renewable, and alternative energy industries and a leader in development and support for new energy-related technology. 7) PLG Power – is a vertically integrated company operating in the PV sector since 2008. The company is a part of a big, well-established Indian Group, PLG Group, which is almost 100 years old company diversified into numerous businesses in Asia and Middle-East. 8 ) Maharishi Solar – has a vertically Integrated manufacturing facility to produce multi-crystalline silicon ingots, Multi Crystalline wafers, Multi/Mono Solar cells, SPV modules and SPV systems in Andhra Pradesh. Maharishi Solar also designs, engineers and manufactures a wide range of Solar Panels, Solar Water Heaters, Solar Air Conditioning Systems, Swimming Pool Heating etc. for various Residential, Commercial & Industrial projects. 9) Kotak Urja Pvt. Ltd. – is one of the pioneering companies in India dedicated to the promotion of eco-friendly and environmentally safe renewable energy technologies. The company has forayed into solar PV technologies by establishing at that time an advanced PV module manufacturing facility. Over the years, Kotak Urja has developed expertise in Design, Engineering, Manufacturing, Integration & Installation of a broad range of solar thermal & solar photovoltaic systems and aspires to achieve a dominant position in the growing PV market in both India & globally. 10)Photon Energy Systems – established in 1995, is a leading manufacturer of Solar PV Modules, PV Systems and Solar Thermal Systems in India. Note there are some other solar module producers as well.Note most of these companies import solar cells which are the main technology differentiators as there is very little addition in solar module production part of the supply chain. If you are a large consumer then the best way to buy low cost panels is to import them from China or Taiwan.There are many high quality companies existing in these countries like Suntech,Trina Solar,Yingli Green Energy etc.In fact a number of these companies supply panels to high priced European and American companies.However if you are a small buyer then you have to look for a distributor/wholesaler who can sell you a good quality brand at low costs.Typically you have to pay 30-40% more for panels from these suppliers than directly buying from the companies themselves. Besides Solar Panel Producers,there are a number of wholesalers and distributors who sell solar panels to small customers.You can find different lists of these distributors from different sources which are given below.Note you have to do your own due diligence in finding distributors who give you good quality solar panels at low cost. India has a massive potential in Solar Energy with at least 20 GW of Solar Power to be installed by 2022 according to the JNNSM Plan. This is a conservative target with more Solar Power in India to be installed as state government and falling prices of solar energy lead to much higher numbers. The list of solar companies in India has kept growing with a number of startups and established larger companies entering the solar industry. Foreign solar power companies too have increasingly started to set up base in India. However, lately solar companies around the world are facing hard times with bankruptcies galore. Not only hundreds of small installers, erstwhile behemoths like Q-Cells have defaulted on debt and declared bankruptcy. The biggest and oldest Indian solar panel companies like Moser Baer and Tata BP Solar are facing survival questions. These companies have seen departure of top executives and are looking for CDR resolutions . Moser Baer which had invested hundreds of millions in investments into crystalline silicon and thin film solar is having difficulty in paying back its debt. Other companies like Indosolar are also looking like a write-off. Indian Solar Panel Companies are asking for protection from cheap imports from China and other countries. Note the prices of solar panels have fallen by 60% in 2011 due to a number of reasons such as cheap raw material polysilicon prices,high competition between major module manufacturers, dropping processing costs. The biggest reason for the solar panel price crash has been the support of the Chinese and other Asian government to their respective domestic solar industries. It is a fact that many of the major solar module companies would be bankrupt right now without government support. LDK is the prime example of a zombie company flourishing on the back of Chinese government support. Indian solar panel makers have got some protection with the federal subsidy policy JNNSM mandating that cell and modules be made in India. However thin film solar panel technology is exempt which means that they are not fully protected. Besides state government solar polices do not protect them at all. The consequence has been that most of the solar panel companies are running at 0 to 20% utilization as orders dry up. 113 Responses so far | Have Your Say! What do you say about this news from green chip stocks co-founder Jeff. It is very shocking to be true. Marketing Gimmick…. Don’t think it works.Unless its certified by reputed labs like NREL,Fraunhofer,ignore such videos and posts. I need 20watt’s 30 panels , price please. capital funding in the amount of – $ 3000 000.
to manufacture industrial design and conduct an independent test. REQUIRED AMOUNT OF VENTURE FINANCING – $ 3000 000. 10 days after the expiration of funding. propose % Of revenue from the sale of technology. Our technology has a wide range of potential buyers. photo electric plates in the application of new non-silicon materials. the efficiency of which is 35,8%. a number of technological problems. 1. We left a substrate of mono silicon. temperature of 20 degrees Celsius. Properties of mono atomic amorphous silicon are truly unique. Cost to automobile 1 gr. This material does not exceed $ 100. * extreme layer is an anti-reflecting the carbon coating. Total efficiencies achieved over 35%. 10-15% while the efficiency of our Sell more than 2 times better. application in the electronics industry. speed and memory in the old scale of the chip. We have plans to use this technology in other areas – space, medicine ..
pilot an industrial design in December 2011. We are interested in quickly attracting investment. PLZ GIVE ME UPDATE DETAILS ABOUT SOLAR PANEL THROUGH EMAIL. we are a TUV listed manufacturer of solar panels from China. Affordable price and good service. Ready to do business with everybody. I want to have idea about cost of complete operational system for 1 Fan and 40-60 watts fluroscent bulbs for about 3/4 hrs a day. you can get a solar panel,battery (to store the power),an inverter and wiring which costs around $5/watts.Your requirements would seem to be around 120 watts so your cost would be around roughly $600 watts or Rs 27,000. That is a rough general estimate.You might want to get quotes from solar power system installers/integrators in your region. We have a solar panel manufacturing plant for sale located here in germany, because of financial & family problems ready for sell. If you more interested we send you some pic of the production plant. We are infra and power company in India.We are interested in distributing solar panels and solar tower plants in India. If you are interested please email me with complete product details,best price and terms. We are interested in distributing solar panels and solar tower plants in India. If you are interested please email me with complete product details,best price and terms. We are interested in gathering details on Solar panels and the complete system for our forth coming project. If you could provide us with technical and commercial details for installation of solar power system in Mumbai-per K-watt energy production. solar street light, solar garden light etc. if u need then plz cotact us. I have 3 KW batter inverter to run my office which is supported by 4 batteries. It is working fine. Now batteries are charging from A.C. Can I put solar panels to charge my batteries instead of regular A.C. current. How much it will cost. Could you provide the details of what I have to purchase and cost also. You would need around 500 watt solar panels (current retail prices are $2.5/watt,wholesale is $1.3/watt) which would imply around $1250 in cost.Then you would need a solar installer to do the cabling,provide you a solar inverter which converts the DC to AC and also a solar charge controller which would regulate the charge stored in your inverters.Normally the government of India has set a benchmark price of Rs 180/watt . So 500 watts you would need around Rs 90000 to get this done. Sir, I want solar system in home and my requirements are 7 tubes, 1T.V,4 fans and 1lPC. Would you tell me how much cost for these things. Thank you. I have done M.Tech in Energy Studies with specialization in Solar Energy from IIT Delhi. I am from a Business background family. Our business is mainly related to construction but now we are planning to added the Renewable Energy sector in to our business. As we are from Assam we can help the manufacturers or the developers of Renewable Energy to expand their business in the entire North East India. We are ready to engaged in the entire value chain or parts of a Renewable Energy system. please get in touch with me per E- Mail, so that we can talk over on your project. Thanks from Subroto. Hi, We are a leading manufacturer in China specializing in solar products. Main products: solar panels and solar home lighting. Winsun Solar Power Technology Co.,Ltd. All of about information is best for my knowledge. Thanks to all of you. L’Obel Solar Power System Team. Dear sir we want in solar power plant in over place in Punjab. we need full details.and cost for 5kw capcity. we need costing of plant. We developed a new portable solar power kit to power LED lams and charge the mobilephones,the kit is 100% sola powered.For more information,please do not hesitate to conact us or visit our website. Information share is worth reading. We would like to purchase solar panel of 150 Watt or of 300 Watt. I.Vsiwhanath from TESA (from Germany ) is into manufactruing of PE Foam tape for Solar Module having TUV & UL Certifications.Any one want quey please contact.E-mail:fssz003.india@tesa.com,Mob:08790751902,India. i like solar panle to fix my house in india,in madurai near tirumangalam.i neet to price off, 130 watts panel ,can u send me in full detail. HI ! I am jagdish from Paralakhemundi in Odisha.Sir, I want solar system in home and my requirements are 7 tubes, 3T.V,6 fans and 1lPC. Would you tell me how much cost for these things. Thank you. I WANT TO INSTALL LOW COST PANEL FOR FREE DISTRIBUTION IN RURAL AREA OF UTTAR PRADESH WHERE IN 21ST CENTURY PEOPLE ARE BOND TO LIVE IN DARK YOUR ARTICLE GAVE ME A LIGHT TO WORK OUT SOME SPECIAL WAY FOR IT. Thank You, It is nice to hear that. We are the solar panels manufacture based in Mumbai and our product range is from 20 watt to 300 watt at very competitive price with all the certifications such as TUV, ISO 9001, ISO 14001, Safety class, Ammonia test pass, salt mist corrosion test pass. for quotation please mail the inquiry at prashant@pvpowertech.com or 8108508866. We are a consultancy firm,offering services in power sector.Our client #x is interested in installing solar pv systems for houses of their employees,500 house holds.Capacity of each system can be 500 va/1000va.Some of the houses have inverters installed,charging from local grid supply. We are interested in buying solar panels.We also wish to know your price per watt(solar panel). how many amout need for installing the solar system 50w. Very useful. Can someone answer general people’s question! how much does it cost to setup solar system for a house in Tamilnadu? Hi We are authorised MNRE team, providing consultancy & implementation of SOLAR system in your home based on your requirements. You can approach us chennaimadhurisolar@gmail.com. 1kw roughly 1.5l and you will get 30% discounts/subsidy from MNR. We will process for you. you have to pay only amount lesser of 30% MNRE discounts. I am interested in purchasing several complete 6kva solar systems, with all necessary equipments. I will greatly appreciate if you can send me a price quote for such a system. What’s up, I want to subscribe for this web site to take most up-to-date updates, so where can i do it please help. Obama science adviser John Holdren proposed blasting sulphate particles into the atmosphere to block the rays of the sun. For your requirement of Solar Panel, Inverter, Batteries, Charge Controller, Solar Pumping System please contact. We are offering solar panels costing Rs. 30=00 per watt. I want to install solar pv on my house roof top, Please mail me details of cost involved to do the same equipment wise,and types of solar panel,their prices,life,and return period comparison , so that i can make my decision effectively. son wanting to put solar panels in home in village near codoly. how much will it cost to install? I am interested in installing a solar ( preferably PV ) set up on the Flat roof top of our Society building in Mumbai, India. Area is approx 2500 sq feet.Please advise whom I have to approach for help in this project. My E Mail is kamath@hotmail.com Is it possible and may be cheaper to import from Taiwan. We Urja global ltd. Having 16 MW solar module manufacturing unit in Jaipur , we also channel partner of MNRE our module having 17% more than efficiency. Interested candidate or trading company can contact us for O&M. I want to buy a solar system for my domestic use.And I want to get subsidies for 200W for 7/8 Hrs per day.what will be the price for good quality low cost. require name of supplier in ulhas nagar Maharashtra. I want to buy a solar system for my commercial purpose/trading .What are the Govt. subsidies & Taxes & duties for solar power business in Delhi ,India. What are the MNRE procedure for Import of Solar Power equipment. hello all, i m dealing in solar system.my custmer requirement is 8-12 watt 250led bulb run for 12 hrs.on solar.how many panels, batteries & inverter r required.also i want 3 kw solar panels.where i will get at low cost. We do solar Grid Tied and Off grid Installations. we are based in Gurgaon. why do u want to install such a high amount in your house? i am confused. The cost will be approx 5 Crores. do u have the space? Dear Mr Gangadhar, we at Punchline Energy are experts in AC Solar Pumps. we have installed more than 350 AC Solar Pumps in India. Do u have no electricity? if u do not have electricity, then it is worth it to spend so much on solar pumps in comparison to diesel Generators. We are in Gurgaon and would love to assist you. i want solar elect.plant for my house plz tell me the cost for panel battary wire instalation etc. for 1 kw. Solar cell & panel cost in India. i want a solar powered air conditioner.so if i want to reduce some batteries and instead of that i use refrigerant storage cylinders (condensed refrigerant accumulator) as the batteries got damaged a lot and its changing cost is high so what would be the price to make that full configuration done?and how many pannels i need to run the ac?even at night when sun light is not present i need atlest 12 hours of back up. i want solar panel kit so i m use 14-16 lights,4-6 fan. please help me. how much panel n battery i m use in my home. How much solar panels will be required (full specs) for 5 fans, 7 tube lights, 4 bulbs, a PC,and 2 ACs?? The cost of 1 watt of solar panel is generally Rs. 35 in India plus you would also require storage system for night time usage. You have to be more specific about your question. The wattage of the appliances specially AC and for much time does these appliances work? Then only I will be in a better position to reply to you. Follow these links to know more about the solar products. You can look up for technical specifications and prices online too. Thanks much for the article. One argument often heard is the high cost of storage and maintenance of storage batteries. How long battereis last would replacement battereis perform as good as the original ones? What options we have for storing energy at low cost and efficiently. what are the real possibilities for a solar inverter to be as popular as an ac inverter?? Solar inverters will definitely gain popularity as it will eventually reduce the pressure on grid, since it will store the power from the sun in case of power outage (off-grid system). Very useful article in the era of solar power. Many articles are available online as a knowledge source for solar power. It is the hope for future energy requirement. A lot of involvement is required in order to improve this science for future. Installation cost for the projects is the reason for slow response as an alternative and clean energy source. Improved solar components from the leading manufacturer reducing the installation burden effectively. Although energy saving efforts will do the job better. Here is an article sharing basics before installing a solar power system. Please contact me I can help for your project…..
Offering Term Loan and PPA model. I want a 1Kv Solar system for my terrace flat. what will be the entire costing and how many fans, lights i can use along with TV & Fridge? There are some branded ones – both Indian and foreign solar panels plus there are some locally made panels selling in india as well. Let me know which ones are you interested in. Quality wise I am more sure about the branded ones price wise they are a bit higher, but I dont think the price difference is very high. I want a 15Kw Solar system for my school . what will be the entire costing and how many fans, lights i can use along with TV & Fridge , computer ? I am working with C P Solar Energy and need 5 kva PCU with waranty of 5 years this is our regurlarly demand approx 40 set per month. Further I need solar panel of effiencicy above 17 percent if some body have than contact us.